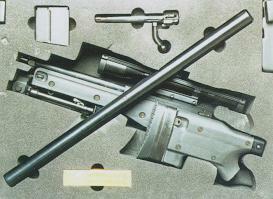 The Covert system is essentially an AWS with a folding stock. It is supplied in a small suitcase which houses the rifle with the stock folded and the barrel/suppressor combination detached - a package offering the utmost precision for discreet deployment. As with the AWS, the Covert system is designed for use with subsonic ammunition which, depending on the target, yields an effective maximum range of around 300m. To ensure optimum precision, longevity and readiness, the suppressor utilizes a baffle system rather than disposable neophrene wipes. Its noise levels are similar to those that are generated by .22 LR match ammunition. Due to the steep trajactories of subsonic ammunition, some form of accurate ranging is necessary to ensure first-round hits. The new Mk II sight with parallax adjustment helps with this in the absence of a dedicated rangefinder. A fixed power 6x or the 3-12x50 variable are ideal optics for this rifle, as it is intended for the type of close work that often requires optics with a wide field of view and close range focus. While the Covert system's compacted size is considerably smaller than that of any conventional system, its special barrel and integral suppressor keep the weapon's overall length within normal limits when deployed. The user can remove or install the barrel/suppressor combination in a matter of minutes. As with other integrally-suppressed systems, a slightly higher sight mount may be necessary to ensure that the suppressor does not intefere with the optics' objective lens. The rifle is normally supplied in a polymer suitcase that is lined with closed-cell foam featuring cutouts for the stock/action/optics/bipod combination, the bolt, the suppressor, a magazine and a box of ammunition.